Anyone and everyone who relies on their truck for their livelihood knows the importance of getting the most powerful, most capable, most dependable, most rugged, and most reliable pickup truck available. Those same people also know Akins Ford near Atlanta, GA, is the best place to go to find the new Ford trucks that offer exactly what they need. That’s true of the new 2019 Ford Ranger and Ford F-150 lineups, as each offers the best-in-class power and capability needed to get the job done day in and day out. 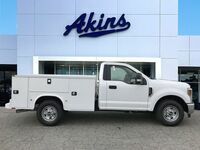 It’s also true of the 2019 Ford Super Duty lineup, which brings additional power and capability for the toughest of jobs. But what exactly is powering the 2019 Ford Super Duty lineup? 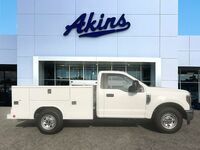 Let’s check under the hood to find all you need to know about the 2019 Ford Super Duty Engine lineup here at Akins Ford near Atlanta, GA.
Like the new Ford Super Duty lineups that have come before it, the 2019 Ford Super Duty lineup offers both a regular gas engine option and a diesel gas engine option. Both options are available for most of the 2019 Super Duty lineup, though all 2019 Super Duty Limited trim levels can only feature the diesel engine option. But enough about that – let’s now take a more in-depth look at these impressively powerful and capable engine options. As we mentioned, the standard engine for most of the 2019 Ford Super Duty lineup is a 6.2-liter SOHC 2-Valve Flex-Fuel V8 engine offering 385 horsepower and 430 pound-feet of torque – which just so happens to be a best-in-class torque rating for regular gas engines. 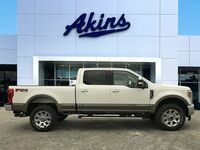 The diesel engine that’s standard for all 2019 Ford Super Duty Limited trim levels and available for the rest of the lineup is a 6.7-liter Power Stroke Turbo Diesel V8 engine offering 450 horsepower and 935 pound-feet of torque – both of which are best-in-class for diesel engines. But the powertrains of the 2019 Ford Super Duty lineup are more than just best-in-class horsepower and torque ratings. They also feature available class-exclusive adaptive steering capabilities, a driver-activated diesel engine-exhaust brake, adaptive cruise control, and class-exclusive Live-Drive Power Takeoff technology. 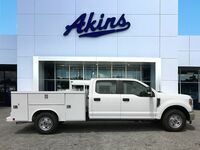 For more on the 2019 Ford Super Duty lineup’s engine options, please contact our staff here at Akins Ford near Atlanta, GA.